NEW YORK—It was the last leg of their journey. Daniel Kopulos and the other members of the Scarlet Macaw Project had eaten nothing but tortillas for the past couple of days. The forestry department had just battled a forest fire and needed to be fed, which meant food supplies for Kopulos’s team had become dangerously low. But, they pushed onward, climbing trees and hiking six hours a day in Guatemalan jungles to save critically endangered birds. And it was all worth it. The scarlet macaws of the Mayan Biosphere is an avian species that only has 300 members living in the wild. Since the project began in 2001, the macaw population has doubled. 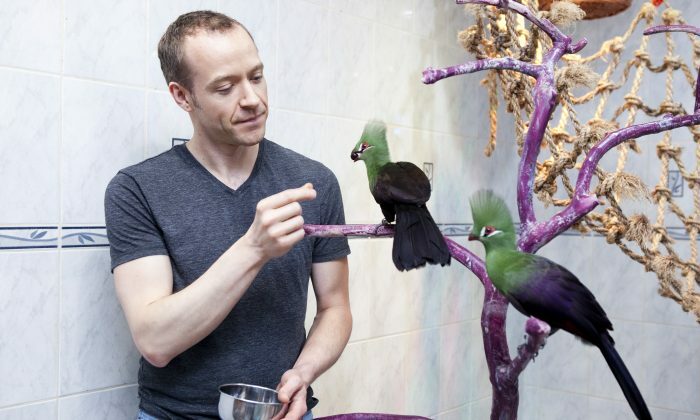 Kopulos leaves Fauna, his exotic pet shop in the Upper West Side, for a month every year to travel to Guatemala for the project. He and the other members of the Scarlet Macaw Project bring medical supplies, equipment, as well as training to assist with nest protection, artificial nest construction, chick rearing, veterinary monitoring, and education initiatives. They also work to save the endangered Mesoamerican river turtles and jaguars in the area. “The country’s people are so humble, they are so willing to help each other out,” Kopulos said. Kopulos, himself, is also remarkably humble. He has been the zookeeper of Nashville Zoo, and worked 10 years as a veterinarian technician for a prestigious Nashville clinic. Yet despite his busy schedule, he remains calm, and converses with the people in his store with a genuine interest, even if they do not buy anything. In fact, he would rather they buy nothing than buy the wrong pet. Although Kopulos has strict standards, he speaks to people gently and with patience. Fauna not only sells supplies and pets, but also offers pet sitting services. The store boards reptiles for owners who will be gone for long periods of time, and offers avian behavioral consultation. While some may find a conflict with selling pets and wildlife conservation, Kopulos finds a balance. “None of our reptiles and birds are imported. We don’t support that industry,” he said. “If we didn’t have to do any animal sales I would be happy as well if we could sustain from supplies alone. But I also I don’t mind being a good source for animals,” he said. Fauna is New York City’s largest exotic pet store, selling exotic birds, reptiles, and fish—such as the frog fish, a fish that walks rather than swims. Kopulos grew up on a farm in Nashville, Tenn. For some years, his family home looked like a wildlife rehabilitation center. Kopulos recalled navigating his house through injured raccoons and squirrels. Kopulos got his first bird, a cherokee, at age 11. A year later, he began breeding birds. Kopulos said that developing empathy is very important for a child, and he hopes his store can provide an outlet for urban children to learn empathy. “I want to continue to be a source of information for people, a center of the community. People come in just to watch the birds. I like it to be a place for kids to come too, especially in the city who don’t have a lot of exposure to animals,” he said. Kopulos is currently training people to help with the Scarlet Macaw Project in Guatemala. When the project becomes more stable, he hopes to find time to do conservation work with sun bears in China, as well as birds in Indonesia. Heike Bachmann, the woman behind the voiceovers talks about what it means to be human.